With so much uncertainty all around, FTI answers: What are the most important emerging tech trends that are most likely to impact business, governing and society in the near-future? It’s time to get comfortable with deep uncertainty. In the coming year, the first commercial spacecraft will take humans into space for fun rather than research, opening a massive business opportunity for insurers, space companies and the hundreds of providers within the space ecosystem that make all the needed peripherals and components. We’ll also see the launch of of galactic ride sharing companies, which will transport a variety of payload into orbit: tiny satellites, art installations and even cremated remains. What we don’t yet know: how investors will react once the first accidents occur involving all that precious cargo. It is plausible that edited humans will be born this year, and as new genetic engineering trials on sperm and on human embryos get underway, we don’t yet have global norms and ethics standards on the clinical use of germline editing. This opens up the field to regulation on a country-by-country basis, which will give some companies and researchers a strategic advantage over others. >> Download the report here. These and other questions loom on the horizon for 2019, and not all organizations will address them methodically. Leaders often make common errors as they make strategic decisions about the future: they either under-predict or over-predict change. The reason? Most of us find uncertainty uncomfortable, so we are reluctant to confront it. While you cannot solve for future uncertainty, you can prepare your teams to think strategically using data-driven signals, trends and outcomes. Focus on connections, not predictions. Doing so will help your organization get ahead of disruption in order to build your preferred futures. At the Future Today Institute, we identify emerging tech trends and map the future for our clients. 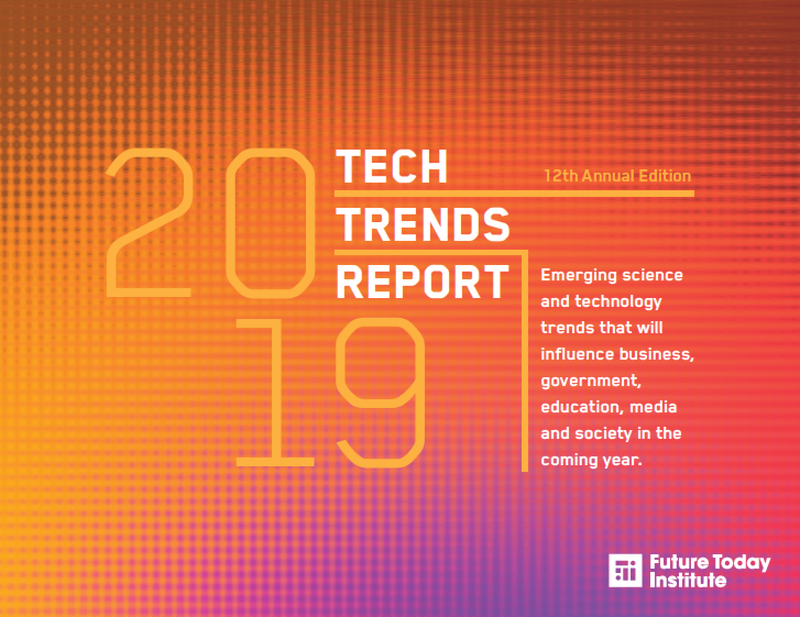 This is FTI’s 12th annual Tech Trends Report, and in it we identify 315 tantalizing advancements in emerging technologies — artificial intelligence, biotech, autonomous robots, green energy and space travel — that will begin to enter the mainstream and fundamentally disrupt business, geopolitics and everyday life around the world. 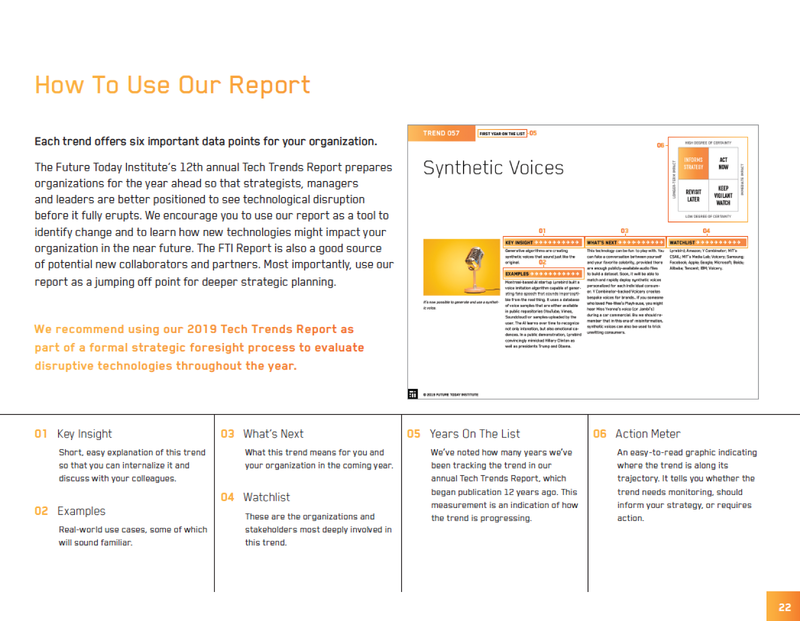 As of the publication date, the annual FTI Tech Trend Report report has garnered more than 7.5 cumulative views. We invite you to use, share and build upon the material in our 12th annual Future Today Institute Tech Trends Report. We are making it freely available to the public. This work is licensed under a Creative Commons Attribution-NonCommercial-ShareAlike 4.0 International License. Privacy is dead. One persistent theme in this year’s report is surveillance. Whether it’s how hard we press on our mobile phone screens, our faces as we cross an intersection, our genetic matches with distant relatives, our conversations in the kitchen or even the associations we keep, we are now being continually monitored. Just by virtue of being alive in 2019, you are generating data — both intentionally and unwittingly — that is be mined, refined, productized and monetized. We no longer have an expectation of total privacy. At least not like we’ve known it before. Companies that rely on our data have new challenges ahead: how to store the vast quantities of data we’re generating, how to safeguard it, how to ensure new datasets aren’t encoded with bias and best practices for anonymizing it before sharing with third parties. VSO is the new SEO. About half of the interactions you have with computers will be using your voice by the end of 2020. Whether you’re talking to a smart speaker, or your car’s dashboard, or your mobile digital assistant, you’ll soon talk more often than you type. As content creators venture into spoken interfaces, publishers and other companies will soon be focused more on voice search optimization (VSO). The emergence of VSO affects scores of industries: advertising, hospitality and tourism, finance and banking, retail, news and entertainment, education and more. This means opportunity: there’s an entire VSO ecosystem waiting to be born, and first movers are likely to reap huge windfalls. But it also signals disruption to those working on the business side of search. The Big Nine. There are nine big tech companies — six American, and three Chinese — that are overwhelmingly responsible for the future of artificial intelligence. They are the G-MAFIA in the US: Google, Amazon, Microsoft, Apple, IBM and Facebook. In China it’s the BAT: Baidu, Alibaba and Tencent. Just nine companies are primarily responsible for the overwhelming majority of research, funding, government involvement and consumer-grade applications. University researchers and labs rely on these companies for data, tools and funding. The Big Nine are also responsible for mergers and acquisitions, funding AI startups, and supporting the next generation of developers. Businesses in the West will soon have to choose AI frameworks and cloud providers — likely Google, Amazon or Microsoft — a decision that will be extremely difficult to reverse in the future. Personal data records are coming. We will start to see the emergence of “Personal Data Records,” or PDRs. This is a single unifying ledger that includes all of the data we create as a result of our digital usage (think internet and mobile phones), but it will also include other sources of information: our school and work histories (diplomas, previous and current employers); our legal records (marriages, divorces, arrests); our financial records (home mortgages, credit scores, loans, taxes); travel (countries visited, visas); dating history (online apps); health (electronic health records, genetic screening results, exercise habits); and shopping history (online retailers, in-store coupon use). AIs, created by the Big Nine, will both learn from your personal data record and use it to automatically make decisions and provide you with a host of services. Your PDR will be heritable — a comprehensive record passed down to and used by your children. Ideally, you will be the owner of your PDR, it will be fully interoperable between systems, and it the Big Nine would simply act as custodians. We are at the beginning of our transition from email and social media logins and passwords to PDRs. China continues to ascend, and not just in artificial intelligence. China is pushing ahead in many different fields. It has launched a space race with ambitions not just to return humans to the moon, but to build indoor farms and livable spaces on the lunar surface. It is making bold advancements in genomic editing, in humans as well as in livestock and produce. Through its various state initiatives, China is building infrastructure and next-generation internet networks across Southeast Asia and Latin America. It is setting the global pace for air quality, carbon emissions and waste reduction. China’s electric vehicle market dwarfs every other country in the world. All of that in addition to China’s significant investments and advancements in artificial intelligence. Don’t be tempted to monitor each of these trend areas alone — you’ll miss the connections that signal something much bigger is afoot. No other country’s government is racing towards the future with as much force and velocity as China. This means big shifts in the balance of geopolitical power in the years ahead. Lawmakers around the world are not prepared to deal with new challenges that arise from emerging science and technology. In 2019, we are sure to see proposals for new regulatory frameworks. However these new rules, regulations and policies won’t be modeled to understand their broader, next-order implications. Or whether they can be enforced, as technology and science continue to evolve. Consolidation continues as a key theme for 2019. We have been monitoring consolidation across the big tech giants, news and entertainment media, robotics, home automation and biotech for the past few years, and we anticipate more of the same for the near future. Consolidation tends to mean a concentration of resources, which often acts as a driver of acceleration. This will help those working in some areas of tech and science — and it’s good for business. But consolidation tends to draw the attention of regulators, especially in the US and EU. This is our 12th annual report. In total, our tech trends reports have now received a cumulative 7.5 million views. This year’s report is our biggest ever with 315 tech and science trends and 48 future scenarios across 26 industries. 50 Smartest Cities: For the second year, we have ranked the world’s smartest cities — did yours make the list? Now more than ever, every organization should examine the potential impact of tech trends — and leaders must be willing to take incremental actions. Organizations must factor the trends in this report into their strategic thinking for the coming year, and adjust your planning, operations and business models accordingly. Failing to track trends in a meaningful way will put your competitive advantage, growth and survivability at risk. Founded in 2006, the Future Today Institute helps leaders and their organizations prepare for complex futures. FTI focuses exclusively on how emerging technology and science will disrupt business, transform the workforce and ignite social and geopolitical change. FTI’s forecasting methodology has been featured in the MIT Sloan Management Review and in the Harvard Business Review, and it is taught at universities around the world. Learn more at www.futuretodayinstitute.com. New book: The Big Nine. Quantitative Futurist. Finding tech trends and modeling risk/opportunity scenarios at @FTI. Prof @NYUStern. @Thinkers50 Radar Award.